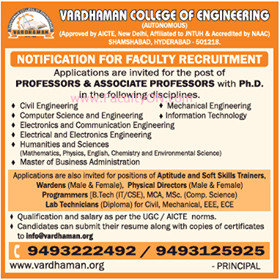 Vardhaman College of Engineering, Hyderabad has advertised in THE TIMES OF INDIA newspaper for the recruitment of Professor plus Associate Professor vacancies. Interested and eligible job aspirants are requested to apply by earliest. Check out further more details below. About College: Vardhaman College of Engineering was established in 1999. It is one of the top 10 engineering colleges in Hyderabad. It is affiliated with Jawaharlal Nehru Technological University, Hyderabad, and was approved by AICTE, New Delhi.